Can you help with information? A sculpture (pictured) that was created by local artist and donated it to the Macleay Island Progress Association (MIPA) was stolen from the Macleay Island Jetty between 3pm on January 6 and 3pm on January 7. 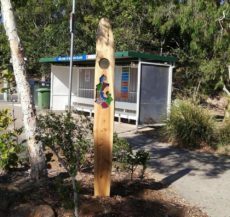 Police are seeking any information from the community which could assist with the location and return of this community project.